Summer time has a flickering glimmer of the tropics when the oriental lilies start to bloom in the garden. Their presence adds an exotic tropical appearance to the garden, while their scent drenches the air . I soon am under their spell when I breathe in their intoxicating fragrance on a late warm afternoon, as I recline in the shade. I am soon off dreaming of white sand beaches and palm trees, as I hear the sound of bees humming nearby. I started growing lilies quite by accident many years ago. I transplanted an Easter Lily potted plant early in May. It died back to the ground soon after that, and I thought nothing more about it. September of the same year it sprang out of the ground, giving a show of three trumpet blooms. The following year in June it bloomed again and so did my interest in the Lilium family. That summer I photographed a wedding in a private garden which was thickly planted with oriental lilies in full bloom. It was the first time I'd ever noticed a lily growing in the ground besides my lonely Easter lily. I asked the mother of the bride about her lilies, and she filled my head up with growing lilies in my garden. Soon after I made my first purchase of bulbs—oriental and trumpet lilies. Of all the bulbs available to gardeners, the most outstanding bulb, in my opinion is the Lily—particularly the Oriental Lily. Without question the flowers of the Lilium genus are some of the most beautiful. 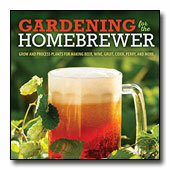 A gardener can choose many varieties to grace the garden. They have an exotic look to them and most will fill a garden with heavenly fragrance. When purchasing lily bulbs keep in mind they never go completely dormant, so getting them promptly in the ground is a necessity. Lilies like a fertile, humus rich, well-drained soil that is slightly on the acidic side. In the Pacific Northwest they do well in full sun or light shade during the hottest part of the day. Lilies like their roots kept cool so a good mulch or ground covers to shade the soil is a good idea. One way I have planted them was at the base of a weigelia shrub. When the shrub flowered in May the branches would weep from the flower's weight. Later as the lilies came up through the branches, the branches supported the taller lilies while shading their bases. Plant the bulbs six to ten inches deep depending on their size. A good rule of thumb is plant to a depth of 3 times the bulb height. Water them in well. Apply a thick mulch of compost over the top both at planting time and annually every year after that. I deadhead my lilies after the flowers fade. When I cut stems for flowers in the house, I leave a good amount of stalk remaining on plant. This insures the foliage will feed the bulb for next year's flowers. I leave the stalk until fall before pulling it off the bulb. After fall clean up I give the plant a good mulch. The following spring I keep an eye out for slugs since they like to nibble on the new growth. The first year in the garden, I have noted, lilies seem most susceptible to slugs, especially if spring planted. Improper drainage is usually the reason lilies fail in the garden. My lilies are normally planted in raised beds to accomplish good drainage. If the bulbs are spring planted they won't flower as well the first year, but the following year should give maximum bloom. I prefer planting mine in the fall, but sometimes I will plant in spring when a beautiful lily catches my eye. You can buy lilies already blooming in a pot, but it will cost more than buying just the bulb. The advantage to this is you can see what your lily will look like in bloom. You can let it finish flowering and then transplant it to the garden. Also you can hide the pot when it finishes flowering (remember to water it) and transplant in the fall. Around Mother's Day you can find them in florists' shops and nurseries. I think they make beautiful gifts for mothers that will bloom again for many years. 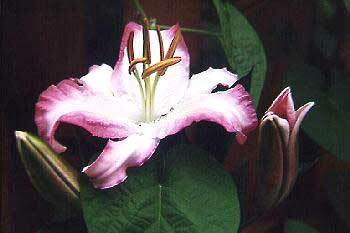 Lilies are fairly easy to start from seed, but since the Orientals are hybrids they won't come true from seed. 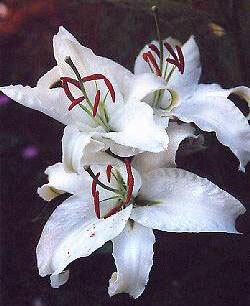 Propagate lilies by removing scales from the bulb after the foliage dies down and replant them. I like to grow mine in a nursery bed of their own for a few years until they reach blooming size. This is an inexpensive way to increase your stock of lilies. Every three to five years lift the bulbs and separate the bulblets from the main bulb for replanting. Oriental Lilies are superb as a cut flower. A single stalk in a vase, with its 6 to 8 flowers or more, is beautiful in its own right. The flowers last for a long time. Cut the stalk after the first flower starts to open but while the others remain in bud. Place in water for a day and the next day recut the stem and put in a vase. Cut the stem and renew water daily, and slowly each of the buds will open. You can throw away the canned air fresheners because one flower stalk will scent a room wonderfully. One thing I do is remove the pollen from the end of the anthers as each bud opens. If you don't don't do this it will eventually fall and possibly stain your table linens. If you do get it on your clothes or linens don't wipe the pollen right away. Wait until the pollen dries thoroughly then brush it away. If you wipe it off while it is still wet it will stain.